Horizons West was a fascinating, thirteen-installment docudrama which traced the movements of the famous Lewis and Clark expedition from 1803 to 1806. President Thomas Jefferson's charter to Captains Meriwether Lewis and William Clark was to trace the origination point of the Missouri River, from St. Louis, Missouri to the Great Falls of Montana--and eventually beyond. Captain Meriwether Lewis' appointment as President Jefferson's personal secretary inaugurates the arc of thirteen chapters of the Horizons West series. 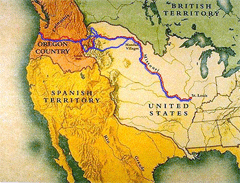 Given the competition for the vast natural resources of the Northwest Territories of the United States, President Jefferson undertook to devise a secret expedition to survey the new territory leading to the Pacific Ocean by first tracing the route and tributary origins of the Mississippi, Missouri , and Columbia rivers, followed by a further exploration leading to a direct route from the origin of the Missouri headwaters, west to the Pacific Ocean. Lewis and Clark's competition along the way would be the French, English and Russian settlers, trappers and officials, themselves attempting to map, track and exploit the potentially rich territories of the Northwest. With the announcement of the securing of the Louisiana Purchase of July 4, 1803, President Jefferson finally felt secure in scheduling Lewis and Clark's ultimate exploration. With a great deal of the land to be initially explored now legally in the possession of the seventeen United States of America, Lewis and Clark's Corps of Discovery finally undertook their adventure in December of 1803. Once Lewis and Clark had met up and established Camp DuBois (on the eastern shore of the Mississippi near Hartford, Illinois), they began to undertake the provisioning necessary for their expedition--all the while under the greatest possible secrecy.